The crispness of the evening crackled around me as I sat on the rustic bench at the edge of the harvested cornfield. I was on a mission; I was determined to watch the moon rise over the horizon. I had toddled down the path through the woods behind my house, laptop in hand, hoodie tied tight around my head. There was rustling about — shuffling and shifting somewhere in the distance as creatures large and small began to find shelter for the night. I sat quietly, laptop on my legs, waiting for the crest of the moon’s edge to peek over the farthest boundary line of earth. There was more shuffling through the skeletal bushes as the shadows grew around me. I pushed away flashes of monsters and rabid raccoons and embraced the thought of it being a bird or squirrel. Little, gentle things. My query was soon answered in the form of a large black bird that appeared on the branch of the tree in front of me. Her beady eyes blinked at me, her head tilted slightly. “What in the world are you doing here so late? Go home! It will be a cold one tonight!” she scolded. I agreed with the bird, watching her shimmy and shake before disappearing into the woods. She was no fool; it was indeed getting chilly. My fingertips began to numb as my eyes kept watch through the barbed wire fence, across the harvested cornfield, past the ridge of trees and farms to the horizon in the distance. As the evening sky turned from lavender ribbons to purple shadows, thoughts of previous generations ran through me. Who knows what our ancestors thought when they looked up at the night time sky? I knew that the Andromeda Galaxy glowed in one of the legs of the W of Cassiopeia, and the right side of the cup of the Little Dipper pointed upwards to the North Star. But the locals had taken their own spin on astronomy, leaving me wondering about my long-held beliefs. Does Apollo ride his steeds through the Wisconsin sky just as he did in Greece? Is the constellation Orion actually the outline of a football player getting ready to throw a pass? Does the pointer star really always point towards a tavern? The crow returned, landing very near on the post beside me. She wondered what I was still doing there. I was an alien here. That, and I probably smelled like garlic from my spaghetti dinner. I tried sitting very still, but the bird had never seen a wild woman hanging around on this bench at this hour, and squawked that fact to anyone who would listen. Finally, after making her point, she took off in a huff. Point taken. Yet this stranger in a hoodie still hung around. Sunset gave way to darkness, moonrise only minutes away. Anticipation grew inside of me. Where was the full round beauty that taunted mere mortals with her presence? Where was the crest of her silver hair above the horizon? She was the goddess of the night, the seductress in the midnight blue wrap. Her dark cape sparkled with distant flecks of existence; yet in her full glory there was no star that could match her brilliance. How silent these woods had suddenly become. I sat in vigilant dedication, my shivering the only noticeable movement. I could not see my fingers, my letters, my writing. A subtle numbness started to creep down from the tips of my gloves, yet still I waited. Darkness had covered the wilderness, forcing me to pay closer attention to everything around me. Suddenly, a loud crash and shuffling came from my left. Bigfoot! Hodag! Tyrannosaurus Rex! But, no! Too light-footed! It had to be a deer crashing through the bramble. The hoofed steps stopped on the path, listening. All was silent. We both held our breaths, she in the woods, I on the bench. My heart exploded, leaving me wanting to turn around just for a peek. Turn! Just turn! But I couldn’t. Wouldn’t. What a dip! The moment stretched into an eternity, until finally the doe walked the other way, crunching the leaves in her wake. She must have been making her way to the cornfield, circling away from the soft glow of the computer screen and the odd scent of garlic. I can’t say that I blamed her. Finally the moment had come. The first pinpoint of light in the distance — She appeared! But gasp upon gasps! What was this? Her crown was not the color of ghosts or spider webs — the Lady’s mane was red! 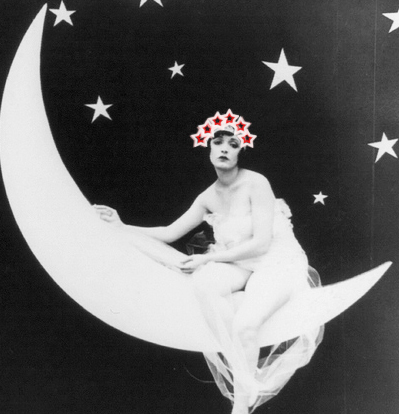 My Goddess of the Night was a crimson-haired tart! Full and round, she rose majestically through the black distance, the world stopping for a moment to honor her presence. Her red mane radiated over the valley and poured across the landscape, Her round orb was breathtaking! Sassy! The Moon Goddess watched over that magical night with the grace of a queen with her crown of rubies. She was beautiful in her new outfit — proof that women could change their appearance whenever they wished. They could be feminine and pure and complex and naughty with merely a change of color — or thought. It was the delight of being female, the magic of the power within. And in return, I heard her say that she’d come to my house for garlic spaghetti any time. ‹ PreviousHave You Had Your Wit Tickled Today?